Watch and Read: Tejas Athni discusses his groundbreaking research during a TEDxPeachtree 2017 talk. To say that Tejas Athni is not your typical teenager is an understatement. Before even receiving his high school diploma from Stratford Academy in Macon, GA, he’s a full-fledged FVSU student researcher, and has conducted the kind of consequential research some scientists do not engage in until much later in their professional careers, if ever. Now, he is tackling finding a cure for the deadliest of brain cancers, found recently in Senator John McCain and which took the lives of the late Beau Biden, Delaware attorney general and son of Vice President Joe Biden, and former Senator Ted Kennedy. He discussed his research last month during a TEDxPeachtree 2017 presentation. TED is a nonprofit organization devoted to spreading ideas. During his research at FVSU, Tejas worked with the plant Bacopa monnieri, which is found all over the world and often regarded as a weed. He noted that the plant contained terpenoids, an organic compound that can diminish human ailments, including cancer. Tejas believed that the plant could help treat Glioblastoma Multiforme, or GBM, the most aggressive and deadly form of brain cancer, which has few treatment options. His mentors at FVSU and the Karmanos Cancer Institute in Detroit helped him develop an experimental framework and procedure aimed at proving his hypothesis, which was that the Bacopa monnieri could have a inhibiting impact on brain tumors. In an FVSU lab, Tejas cultured GBM cells and applied a Bacopa monnieri extract to the cells using a complex process. He found that, as he predicted, the extract inhibited the the proliferation of the deadly GBM brain tumor cells. 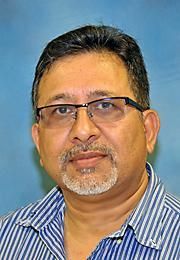 Dr. Nirmal Joshee is one of Tejas’s FVSU mentors. The associate professor of plant science in FVSU’s College of Agriculture, Family Science, and Technology helped Tejas expand his research horizons. “Natural products have been the backbone of traditional systems of healing throughout the globe, and have also been an integral part of history and culture,” Dr. Joshee explained. Tejas knows that many more hours of tests in the lab will be needed to advance his initial research into clinical testing. This was just the beginning, he said. “I am truly optimistic that with further research, Bacopa monnieri can be a novel treatment option targeting GBM. Tejas became intensely interested in plant science and botany during 7th grade biology. “This initial exposure opened my eyes to the possibilities of nature and science, very quickly leading to an internship at the Department of Biotechnology at Fort Valley State University,” Tejas explains. He was only allowed to shadow and watch others conduct experiments that first year, but his palpable desire to conduct research of his own led to an invitation to come back the following year and pursue his own project. His first foray was in the field of plant reproductive biology, in which he learned why two medicinal plants are going extinct in nature. He also learned other skills and techniques, including tissue culture and electron microscopy. “I thought I was the luckiest person on this earth to have at my fingertips all of this cutting edge instrumentation,” Tejas said. Tejas has won numerous national and international awards, including the 2017 American Academy of Neurology (AAN)’s Neuroscience Research Competition. He was also a finalist in the 2017 Intel International Science & Engineering Fair (ISEF), the 2017 iSWEEEP International Science Fair, the 2017 International BioGENEius Challenge, and the 2017 National Junior Science & Humanities Symposium (JSHS). He has presented and discussed his research at various locations around the world, including universities, non-profit foundations, pharmaceutical companies, international medical and scientific conferences, and other speaking venues. On top of all of that, Tejas founded a non-profit organization called CPR Education NovoToro dedicated to teaching basic life-saving skills. He is also the editor-in-chief of an international online magazine, Publizette, and is a contributing author for The Huffington Post.